Within the FanDuel software engineering community we have “10% time” that we can use for personal development. A lot of us use this time to learn new programming languages and techniques. However, my personal development goals for this year involve getting better as an engineering manager. So far this year, I’ve taken internal training courses on interviewing and giving feedback, and I’ve spent time with more experienced colleagues to learn about their experiences. I’ve also identified a small pile of books that I want to read. 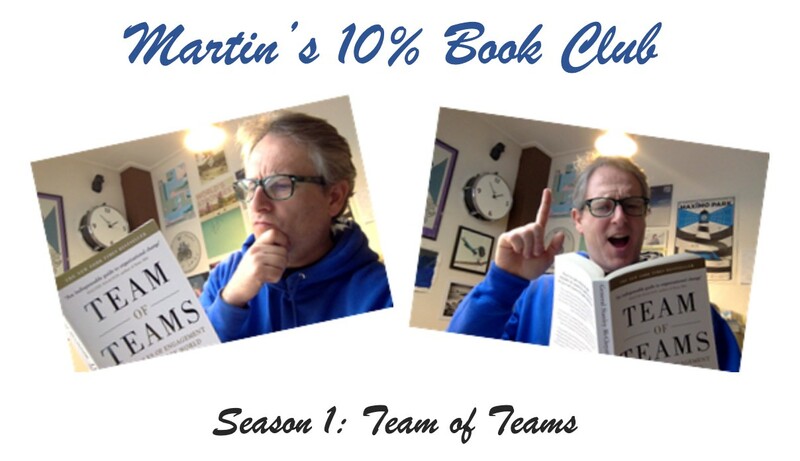 The first book I wanted to tackle was Team of Teams by Stanley McChrystal, Tantum Collins, David Silverman, and Chris Fussell. It’s a 250-page book, with 5 parts and 12 chapters. I wanted to run weekly sessions, but not too many of them. Asking people to commit to a 12-week stretch felt like too much. One part every 5 weeks seemed more reasonable. The other up-front question was how many people to invite to the sessions. I listen to a lot of podcasts, and I’m heavily influenced by the conversational format, but I wanted to get more than just a couple of buddies involved. Conversely, I wanted to give many people the chance to join, but something like 20 felt too much. In the end I settled on 10 (including me) as a nice medium number. From the start I wanted this to be a remote first activity. We’re a distributed company, and I work remotely most of the time. I didn’t want four people to be sitting in a meeting room in Edinburgh, two more in Glasgow, while three others dialled in over video. We tend to take our 10% time on Fridays, and some people like working from home then. Making sure that everyone dials in from their own laptop puts everyone on a level playing field, but it also goes with the grain of how we like to work anyway. 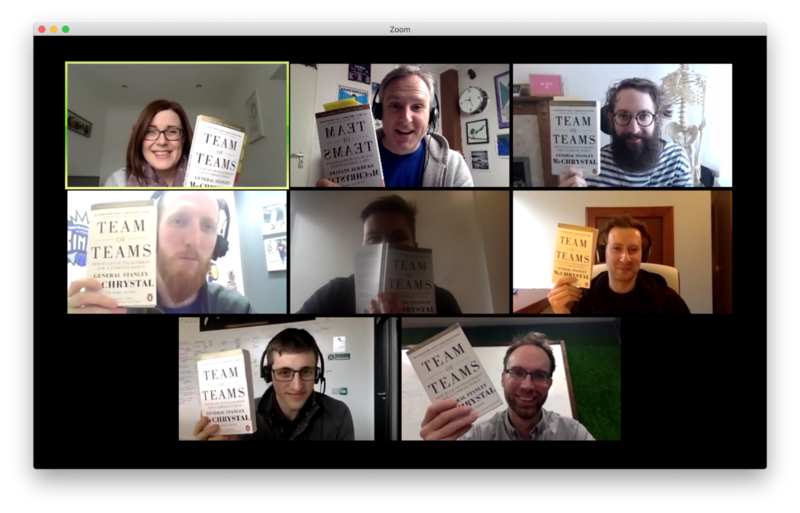 Each week, we will read a few chapters of Team of Teams. On Friday afternoons from 14:30–16:00, we will dial in to a Zoom call to talk about those chapters, share insights and experiences, and think about how we can apply anything we have learned. This first “season” is an experiment, to see if the format works. I’d like to cap the group at 10 participants. Please only sign up if you are willing to make the time to read the book and come along for at least some of the Friday sessions (it doesn’t matter if you can’t make all of them). I will arrange a copy of the book for everyone who signs up. Getting 10 people in FanDuel to agree on a common time slot for five weeks is a challenge. Not everyone could make all of the sessions, and not everyone who could make it could stay for the whole time. But that was okay! My main worry had been that we’d have session where only one or two people showed up at all, and that never happened. Now…I’ve never actually run a book club before. Or taken part in one, for that matter. So for the first couple of sessions I was winging it. While I was reading the book, I was constantly underlining passages and turning down page corners for future reference. I didn’t want to create an agenda for the sessions, but I added a section to the shared signup sheet where we could all scribble down notes and observations for discussion. This worked up to a point, but not everyone used the doc. It wasn’t the right tool for stimulating conversations in advance, and it wasn’t great for starting discussions during the initial sessions. I found myself reading aloud a passage someone had quoted, or a comment they had made, and then going around the (virtual) table asking, “so what did you think about that?” and trying to keep the conversation going. This was hard, because I was trying to be more of an equal participant in the conversation than a driver. I didn’t want to take over! As a result, the initial sessions didn’t feel very purposeful, and the last half hour seemed to drag. When I asked for feedback, the consensus was that shorter sessions would be more comfortable. I also suggested a change of format for the next week: instead of working from shared notes on the chapters we’d read, I’d compile explicit questions the book had inspired, and then pose them to the group. My mental model shifted towards it being more of a panel discussion, with me as the moderator. This worked a lot better. Rather than being busy thinking about my own opinions and what I could say next, my mode shifted towards active listening, where my role was to let everyone else talk, and to be attentive to cues about where the conversation wanted to flow, or when it was running out. (I’m not saying I was any good at this, but it was an interesting observation.) We kept the last three sessions under an hour, and that was perfectly fine. After all, we put in at least that much time each week already just reading and digesting the assigned chapters! Running the book club was fun, but it was also hard work. I was asking people to invest their time in my activity, and I wanted everyone to feel like they were getting a positive experience in return. Hosting the sessions took serious concentration. (I was sweating and in need of a wee tea break after each one.) Apart from the sessions themselves, meeting slots need to be booked, reminder emails need to be sent, pre-and-post session notes need to be tended. A lot like GM-ing a session of D&D rather than being a player. I got out of it exactly what I had hoped for. I would have read the book anyway, but it’s more fun and interesting when it’s a shared experience. I got some more practice at running group meetings. I got to know my colleagues better. Most of all, I was happy that they took something from it. After the dust had settled, I sent out a short survey asking for feedback. One message that came back consistently was that it was hard to keep up. We’re all busy, and many of us have families. Chewing through an extra reading assignment of 50 pages a week is a non-trivial ask. Running the book club over a shorter span of time made it more intense, and perhaps more intimidating. My worry about people losing interest over time turned out to be on the wrong end of the spectrum. On the other hand, several participants commented that the book club was a great encouragement for them to read the book in the first place, and finish it in a relatively short time. There had also been some skepticism around to taking lessons from a military man like McChrystal, but our resistance fell when we got into the meat of the book and found it to have a lot of relevance for knowledge workers dealing with complexity in the modern workplace. Overall, the people who replied to the feedback request said it had been a valuable exercise, especially after we switched to the “panel discussion” format. They encountered some ideas they might not have come across otherwise, were given time and a forum for chewing them over, and as a result the book might stick with them for longer than it would otherwise. I’ll take that as a win! Follow what’s happening behind the scenes at FanDuel, from the people who work there.